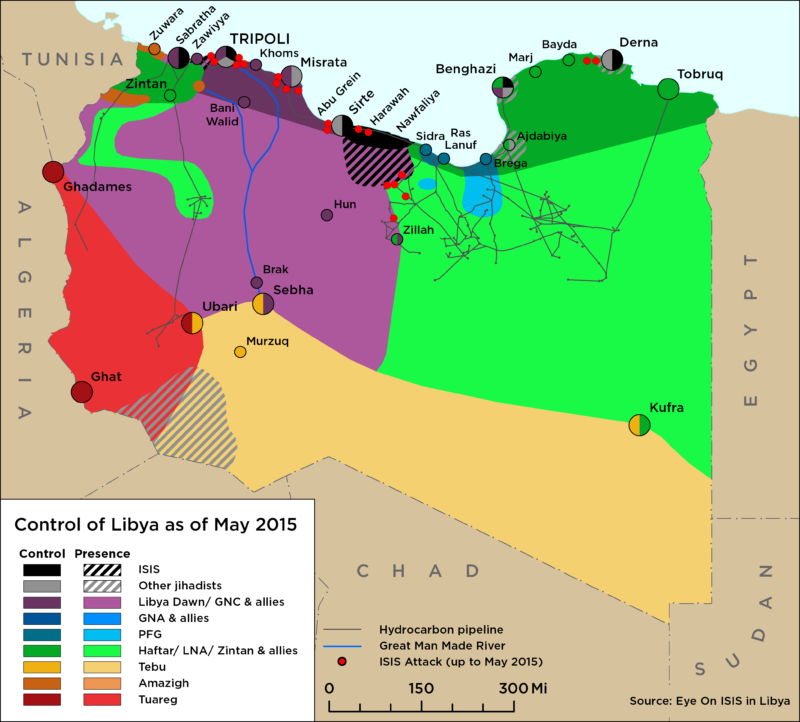 On 9 February, forces who oppose the UN-backed Government of National Accord (GNA) and are loyal to former General National Congress (GNC) prime minister and coup-leader Khalifa al-Ghwell, announced the formation of a parallel military force called the ‘Libyan National Guard’ (LNG). On 10 February, the newly formed LNG forces conducted a military parade in south and south-west Tripoli. A number of militias from western Libya announced they had joined the LNG forces, including militias from Misrata, Zawiyya, Sabratha, Surman, and Gharyan. Other groups from southern Libya also announced they had joined the LNG, including the Awbari operations room, the Tindi brigade and the Tareq brigade in al-Shatti, near Sebha. On 9 and 10 February, clashes between the nominally pro-GNA Abu Salim Central Security militia, headed by Abdelghani al-Kikli aka Ghniwa, and various anti-GNA militias took place in Tripoli’s al-Hadba/Salaheddin area. On 10 February, a large column of Misratan militias, declaring support for the LNG, entered south Tripoli and took positions in the main Man Made River complex on Wadi Rabei road, forcing local militias to blockade a number of roads in this area. On 11 February, brief but intensive clashes with heavy artillery took place between these Misratan forces and local pro-GNA militias. 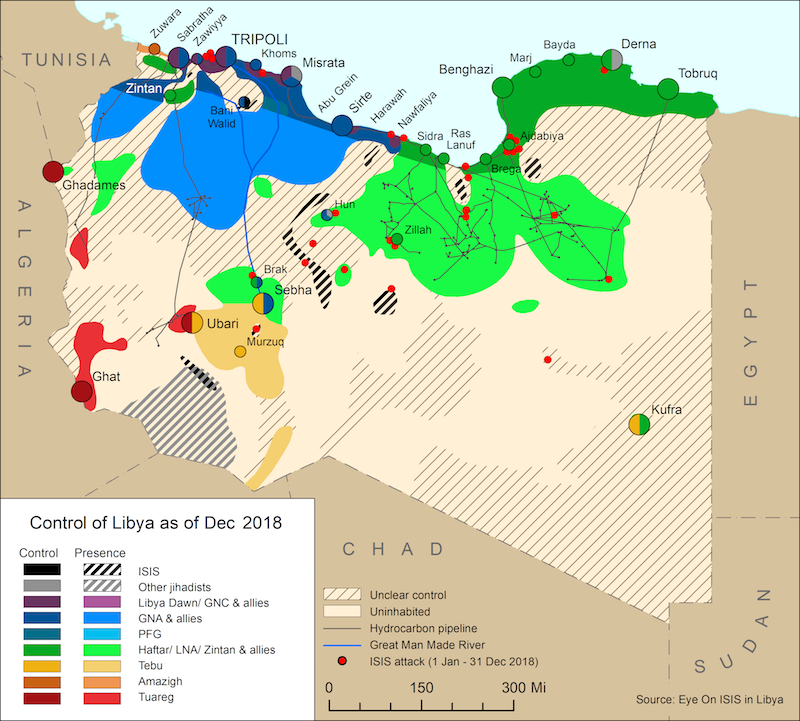 On 12 February, the GNA’s al-Bunyan al-Marsus (BM) command publically disavowed both the Misratan forces that officially switched sides to join the newly established LNG forces in Tripoli and Misratan units fighting with the Benghazi Defence Brigades in Jufra. On 13 February, the GNA’s Presidential Council issued a statement condemning the LNG as an attempt to establish a parallel army, vowing to deal with it legally and militarily. In Benghazi, the struggle for control of the city’s security directorate is intensifying between Haftar’s Libyan National Army (LNA) and the House of Representatives’ (HoR). On 13 February, LNA units in al-Bayda stormed the premises of Faraj al-Barasi, a former LNA military commander. The LNA units abducted a number of people from the location. Members of the Barasi clan, who predominantly control al-Bayda, are threatening the LNA with severe consequences if the abductees are not released within 48 hours. Another LNA commander, Captain Adel al-Dersi, announced his defection live on the pro-Islamist al-Nabaa television channel the same day in protest at the incident, claiming the LNA had become Haftar’s puppet.